Well today was the public release of Visual Studio 2010 Beta 1. It is the first time developers will have the chance to take it for a spin and kick the tires. I wanted to share some information specific for Silverlight developers with regard to Visual Studio 2010 Beta 1. Visual Studio 2010 is the first IDE that will support two key features for Silverlight developers: multi-targeted Silverlight development and editable design surface for Silverlight. The second point also comes with things you might expect (like data binding wizards and dialogs as well – I’m lumping all of that in to ‘editable design surface’). To get started there are a few things you should know. Install Silverlight 2 SDK (if you attempt to run the Silverlight 2 tools installer it will fail with an error message…just install the SDK). Once you have done this, you now have a Silverlight 2 and 3 development machine for Visual Studio 2010 Beta 1. Congratulations! Once you select this option you will be starting development using that runtime version. So remember, it is after you select a Silverlight project type. If you want to change the target version runtime after you’ve created a project, just right-click on the Silverlight project, choose the properties and you’ll see Target Silverlight Version and can change it there. What about the editable design surface? You can also now select items on the design surface and manipulate binding or other properties in the ‘normal’ Visual Studio way (property panes, dialogs). Hey, what happened to my Silverlight Templates…and what about .NET RIA Services?! For right now in Visual Studio 2010 Beta 1, the Silverlight Navigation Application template is not available as a part of the SDK installer (it’s actually a part of the tools installer…which you can’t run for VS2010 Beta 1). 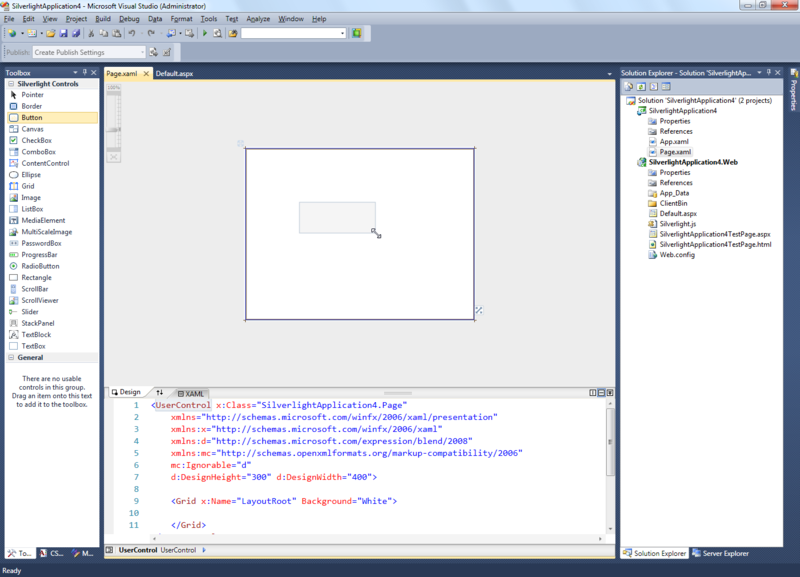 If you want that template, just export one from Visual Studio 2008 and import it into this environment. It will then show up under the My Templates section. .NET RIA Services also will not install for VS2010 Beta 1 right now. So if you want to play around with those bits, stick to VS2008 SP1. Both of these are known and will be resolved in the future. Hopefully you understand that the products are in varying beta stages (VS2010, Silverlight 3 and RIA Services) and are not in sync right now. Kind of a pain, but it’s the sting of early adoption I suppose. So what should you do? Well I do think you should try Visual Studio 2010 and play around with it. If you need RIA Services development, then stick with Visual Studio 2008. If you have the ability to run a second machine or a virtual machine, I recommend putting Visual Studio 2010 in that environment. 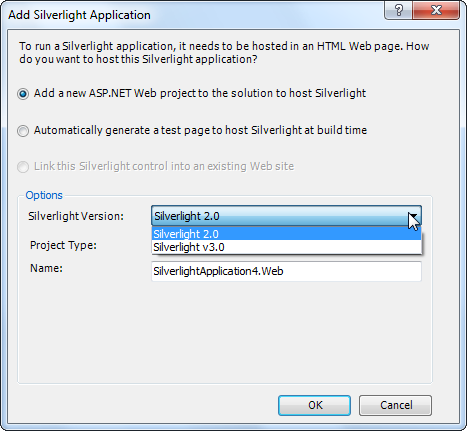 For Silverlight 3 we will be targeting VS2008 SP1 for release. Obviously the team is working on supporting VS2010, but for beta 1, we just couldn’t get it in time. So I’d personally recommend sticking with VS2008 as your primary dev environment for all Silverlight 3 goodness…and run VS2010 in a separate space to play around with.